A fresh-picked hot sauce made from rooftop-grown peppers, organic vinegar, and a secret blend of herbs. Probably unbeknownst to Brooklyn pedestrians passing by below, more than 50,000 pounds of organic produce is sprouting several stories above the borough's bustling streets. That glorious greenery has been delighting shoppers at regional farmers markets and restaurants, and now some is being bottled up to share with you. 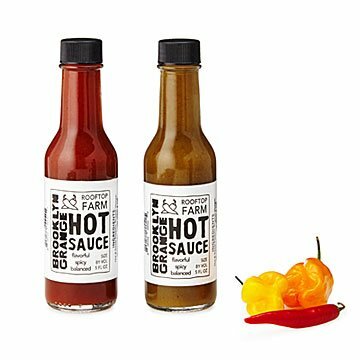 For this fresh-picked hot sauce, the rooftop-grown assortment of peppers are mixed with organic vinegar, and a secret blend of herbs to form a caliente condiment that manages to be full of flavor, but without the burn. Made in Brooklyn, New York. We visited the rooftop garden where the peppers that give this sauce flavor are grown. Tour it with us on our blog. Two 5 fl oz. bottles of hot sauce.